Drink Good Wine. That is my motto and I really want to help you drink good wine. What is good wine? That can be a different thing for each people. Some people prefer red wines. Some only like Cabernet Sauvignon. Some people are very price sensitive, while others have near unlimited budgets. There is good wine at all price points and for red/white/sparkling/fortified wines. I want to help find these wines for you, and post them on MyWinePal. 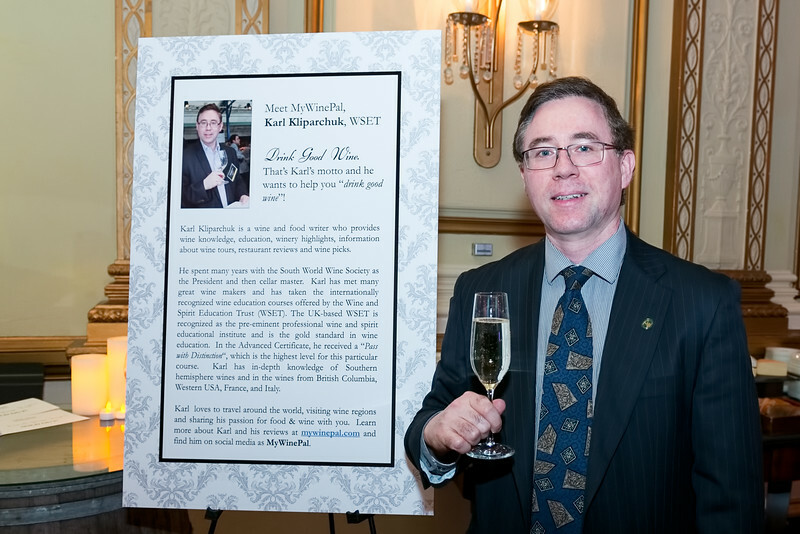 MyWinePal was started by Karl Kliparchuk. I have been the president of the South World Wine Society in Vancouver, BC since 2003 and an executive member since 2002, but now retired from that post so that I can spend more time on MyWinePal. The inaugural South World Wine Society tasting was held on February 17, 2000. Ever since, the SWWS has showcased the wines of Argentina, Australia, Chile, New Zealand and South Africa. By being part of this Society, I attend many Trade events, trying wines that are not yet available to the general public, as well as wines just coming to market. I also have made wonderful relationships with agents and consulates here in Vancouver. I also helped bring in guest speakers from the wine Trade, hosted our events, wrote reviews and managed the SWWS website, and lead some tastings. I have worked for the Mark Anthony Group, which represents the Mission Hill Estate Wines, Ganton and Larsen Prospect Winery, and Sonora Ranch, to name a few. also have taken the internationally recognized wine education courses offered by the Wine and Spirit Education Trust (WSET). The UK-based WSET is recognized as the pre-eminent professional wine and spirit educational institute and is the gold standard in wine education. I have passed the WSET Foundation, Intermediate, and Advanced certificate courses. With the Advanced course, I received a “Pass with Distinction“, which is the highest level for this particular certificate. I am serious about wine and love to share my experience with you. My expertise is in southern hemisphere wines, but I am also increasing my knowledge in wines from British Columbia (Okanagan), Washington, Oregon and California to give you better advice and insights to the wines from these regions. Fortunately with the Internet, there is an archive of most, or all, of the web pages in the world. I checked the wayback website and found what I think is the first wine article that I wrote and published online. It was a Pinotage tasting that was held with the South World Wine Society here in Vancouver in February 2003. Below is the text from the article, or if you would like to see the link to the article with pictures you can click here. This tasting was dedicated to the Pinotage grape. Pinotage is a unique varietal with its origins going back to 1924 in South Africa when Pinot Noir and Cinsault (locally known as Hermitage) grapes were crossed. One of the great benefits of being a member of the South World Wine Society is to taste these wines, which all but one are not available for purchase in BC. The wines selected for this evening are well recognized internationally and many are among the Cape’s Top Performers as ranked in the John Platter Guide. Our reception wine was a Libertas Chenin Blanc which had a refreshing full aroma of ripe pears. Our speaker, Dr. van Vuuren had noted that the Chenin Blanc grape has been used for brandy production in South Africa in the past. Hennie began the tasting by giving us some background on the birth of the Pinotage grape, discussing the two grapes which were crossed for this varietal. The Pinot Noir grape is not very hardy in South Africa compared to Cinsault. Cinsault on the other hand does not have the flavour of Pinot Noir. Crossing the two grapes would hopefully extract the best aspects of both grapes. Hennie had mentioned that from the crossing of these two varieties, 6 viable Pinotage seeds were produced, and these 6 seeds have populated the Pinotage vineyards of South Africa. The Pinotage wines were mainly full bodied, with deep colour. Bouquets varied from sweet, dried fruit to barnyard, leather and oak. Taste covered spicy, oaky, plums, bacon, fruit and tannic. A few wines stood out amongst the group. The Beaumont was quite different in that it had a very fruity bouquet with lots of fruit and cherries in the taste. It was a very easy to drink wine with no tannic aftertaste. Three wines which all rated highly in our favorite wine votes were the Fairview Amos, L’Avenir Estate and the Kanonkop Estate wines. The factor that all three of these wines had in common was a barnyard bouquet. While not overpowering, the bouquet brought in additional complexity to these wines. The Kanonkop Estate also is known for making Pinotage world famous. Of all the wines, the Kanonkop had the most prominent barnyard bouquet. There was also leather in the bouquet. One comment from the group was how well this wine went with lamb. For those people that have not attended one of our tastings, we are served very flavourful appetizers from the restaurant. We all try the wines on their own and then with food. Sometimes a wine on it’s own may not be remarkable, but when paired with a certain food, the wine shines. It was remarked that the Fairview Amos wine would be a very good food wine also. It’s bouquet had barnyard, plum, bacon and light oak. The taste was oaky, spicy, smoky with soft tannins. A surprise wine was poured at the end of the tasting. Dr. van Vuuren and the rest of the attendees were asked to guess the age of the wine. A few guessed 10 years old, but it was revealed that this Pinotage was from 1970! It held up very well over the past 32 years. The wine was Paarl Selected Pinotage. It had a brickish colour, with a barnyard and stewed prunes bouquet. The flavour of the wine was very much like port. Here are some links to interesting wine-related websites. If you have some favorite sites, please let us know and we will add them in over time. Cheers. www.nataliemaclean.com Nat Decants Free Wine E-Newsletter Wine picks, articles and humor from Natalie MacLean, named the World’s Best Drink Writer at the World Food Media Awards in Australia. Natalie is also the author of Red, White and Drunk All Over: A Wine Soaked Journey from Grape to Glass. For more details on this book and to sign up for the newsletter. 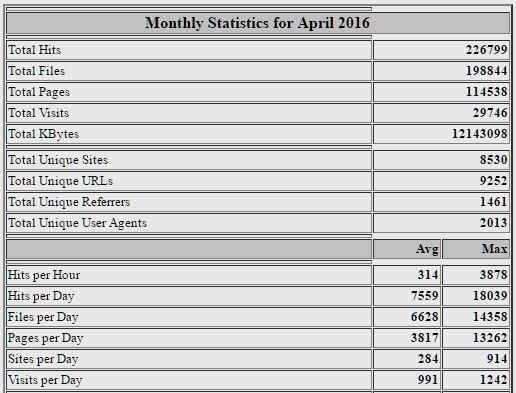 My server stats for MyWinePal.com for April 2016 are shown below. MyWinePal gets almost 1000 visits/day. 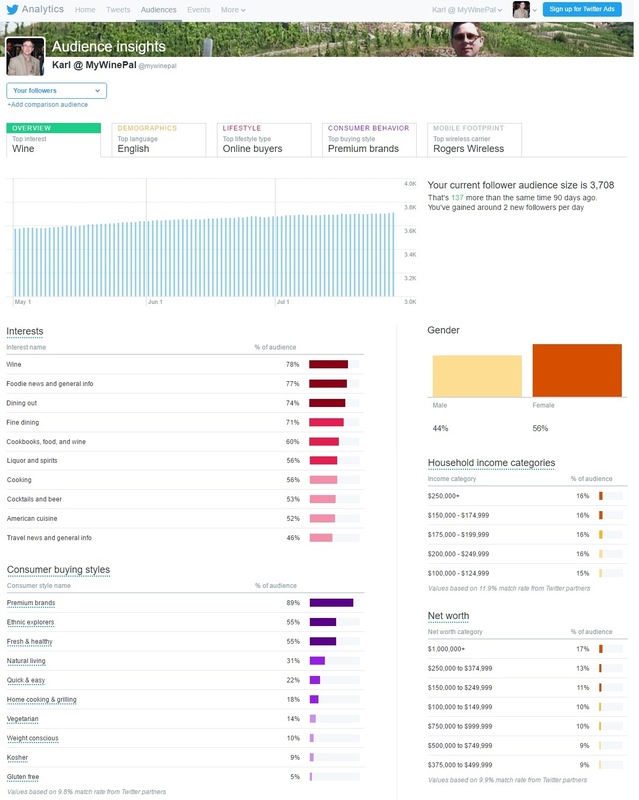 I communicate a lot through Twitter, where I have 3,700+ followers as of July 29, 2016. BC and Yukon Branch with their Wine Wall for their Annual Kidney Gala. If you are a winery or an agency wishing to participate by donating a wine(s) and/or spirits, please check the Kidney Gala Wine Donation Package pdf below. The Gala will be held on March 9, 2017 (World Kidney Day). Please contact me to my e-mail, thanks.